Hatchet-throwing facilities and clubs are opening across North America. Grip your ‘hawk and get into the action. Move over darts, hatchet throwing is on the rise. It might seem primitive, but new clubs allow hatchet hucking in a social setting. The recipe is simple, and the trend is catching on. All you need are axes, wood targets, and a safe place to throw. 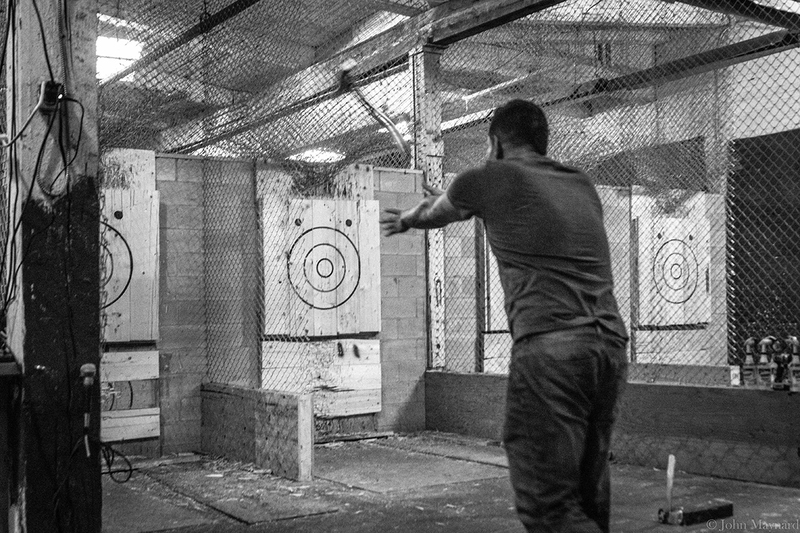 In 2016, three facilities opened in the U.S. — Bad Axe Throwing in Chicago, Urban Axes in Philadelphia, and Stumpy’s Hatchet House in New Jersey. 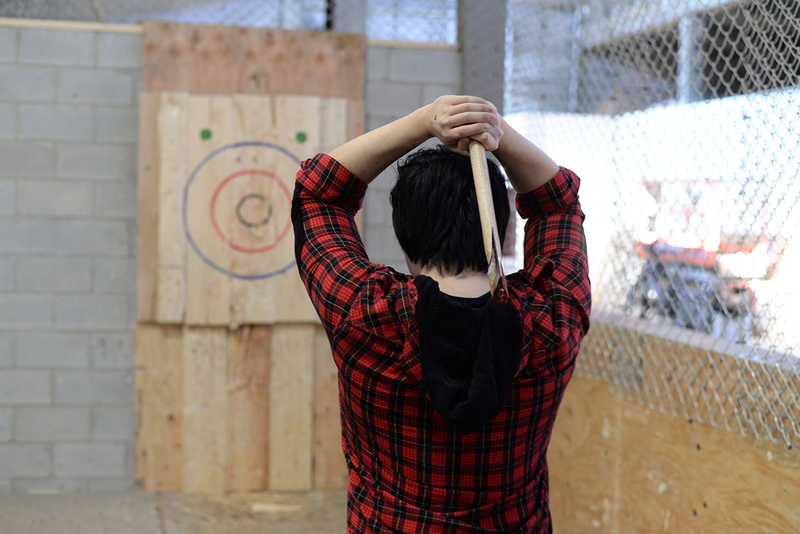 These locations build an axe-throwing community and offer lessons, competitions, and leagues. A simple wooden target is the goal. The pastime is gaining popularity, with some establishments burning through as many as 100 targets a week. Check out the video above from the Canadian Backyard Axe Throwing League for some stoke. Inside axe-throwing destinations, the decor is akin to a warehouse or, in one location, an old boxing gym. High ceilings give space for hurling axes. Heavy walls serve as backdrops around caged areas that contain the flying blades and keep passers-by out of harm’s way. Axe throwing is obviously a little dangerous. With each opening, the U.S. locations encountered difficulty securing a building-use agreement, and equal struggle getting insurance. In one case, an insurer demanded six EMTs on location. That deal didn’t go through. While relatively new in the U.S., one company labels itself as the first. Backyard Axe Throwing League has been around in Canada since 2006 with multiple locations. 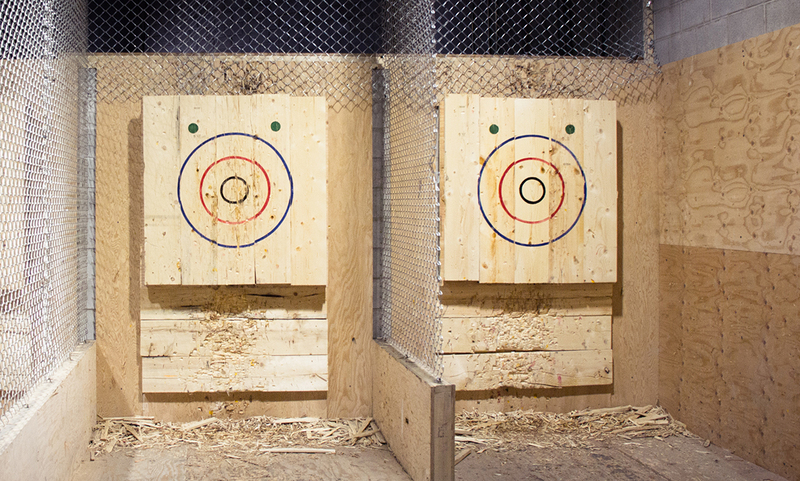 There are more than 30 similar hatchet-throwing spots across Canada. And now at least three are open in the U.S. Axe throwers, mount up! Disclaimer: Axe throwing is dangerous outside proper facilities. Read complete safety information from the NATF here. If you throw axes, do so at your own risk. Be safe. Contrary to the common one-handed axe throwing seen in movies, most locations encourage a two-handed grip. To throw properly, grip the handle like a baseball bat, bring the axe behind your head, and pitch forward similar to the motion when throwing a soccer ball. Release the axe when your arms are parallel to the ground and be sure to follow through with your arms. Backyard Axe Throwing League uses The National Axe Throwing Federation (NATF) rules, which include a three-round match where five axes are thrown per round. The first player to win two of three rounds wins. Scoring is determined by where you strike your axe into the target. The targets under NATF have a black bullseye ring, followed by a red ring, and then a blue ring. The scoring is 5, 3, and 1 point respectively. Additionally, there are green dots in the corner, known as “Clutch,” and must be called in advance (worth 7 points). Point designation is based on where the majority of the blade lands and sticks. For complete rules and regulations, see the NATF website. Who knew axe throwing could be so technical? Of course, safety is one of the most frequent concerns by people interested in axe throwing. Thankfully, the locations above all proudly state there haven’t been any major accidents. The U.S. locations are attempting to secure liquor licenses, although, not surprisingly, that takes a lot of trust. For now, it’s BYOB. Be on the lookout for an axe-throwing league in your town soon.